As much as I love a good Broadway musical, last Sunday's episode came close to giving me my first cringeworthy Downton moment. When Lady Mary strode up the aisle to join Lady Edith at the piano, I felt myself panicking, No, no, please, no singing. But my nervousness paled in comparison to the appalled reaction of the Dowager Countess when the entire room began to sing along. (There is nothin' like a Dame!) Enter stage left . . . Matthew with his servant William and . 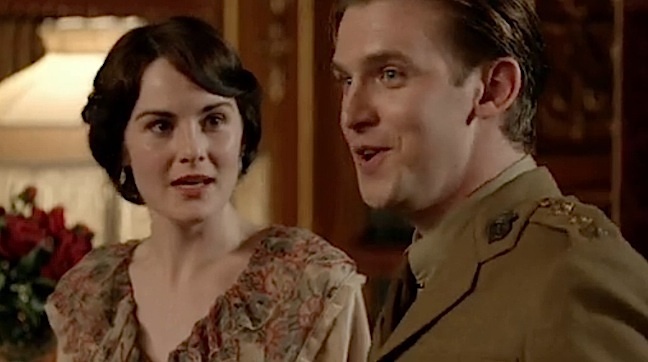 . . a duet with Lady Mary. When I re-watched the episode midweek, I wondered why it had bothered me really. They sing very well . . . and they look so bloody cute together. Watch Downton Abbey Season 2 Episode 4 Preview on PBS. See more from Masterpiece.